This book is about finding yourself and being able to live your life with passion, desire, and a sense of purpose, no matter what comes in life. 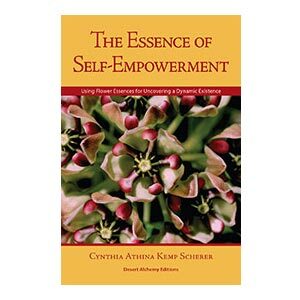 Based upon the author’s journey of unfolding into her life and more than thirty years experience working with flower essence therapy clients, this book offers an overview and intimate look at the essential quality of self-empowerment. Before you can achieve the goals of your life, whether they are happiness, security, peace, enlightenment, or even self-realization, self-empowerment is the one quality that you need to develop that will make these goals possible. Self-empowerment is both what you need and what you gain as the result of healing your core issues. Cynthia Athina Kemp Scherer has been a pioneer in flower essences since 1983. She is the founder of Desert Alchemy, in Tucson, Arizona, USA, and co-creator of desert flower essences from the Arizona deserts. She is an international seminar presenter and the author of The Alchemy of the Desert, The Art & Technique of Using Flower Essences, the Desert Alchemy Expanded Cross Reference, and The Core Issue articles. For those interested in self-study, either on their own or in a study group, “The Essence of Self-Empowerment” has a free study guide to encourage contemplation in the process of uncovering issues that inhibit leading a life of purpose, contentment, and self-empowerment. After reading each chapter in the book, you can use the questions in the study guide to provoke awareness of the themes from each chapter. The study guide is available for download [ here ].